icon Trade on multiple CFD commodities – Brent and WTI crude, heating oil, natural gas, industrial commodity copper, corn wheat, cotton, soybeans, coffee, cocoa and sugar. icon Use dealCancellation* to protect your newly opened trade before significant events. icon Trade on any device with easyMarkets Trading App. icon New to Trading? Our Learn Centre features an extensive library of educational materials. With more than a decade of experience easyMarkets has a proven track record in innovation and customer support. Speak to a representative 24 hrs. 5 days a week via telephone, live chat or multiple messaging services. We were innovators from our founding in 2001, being one of the first brokers to offer credit card funding and web trading. Today we continue to innovate with dealCancellation*, guaranteed stop-loss and take profit. easyMarkets Platform offers zero slippage meaning the price you see, is the price you trade on. Use it with easyMarkets “Freeze Rate” to hold the price for a little bit longer. We offer an extensive roster of risk management tools to our traders including free guaranteed stop-loss, take-profit and dealCancellation* so you can cancel losing trades. Negative balance protection, segregated client accounts and regulation gives you the peace of mind that your funds, transactions and personal information are secure. Accessibility is important when the prices of commodities constantly fluctuate. 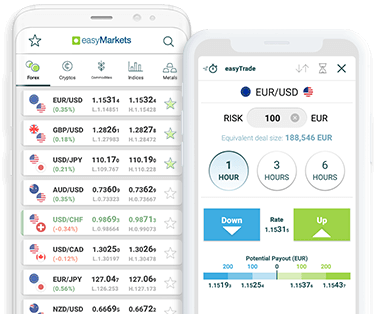 With easyMarkets Trading App you can trade anywhere you have an internet connection. Do you want to trade a significant event but not sure which way the market will go? Don’t worry use dealCancellation* to recover losing trades for a small fee. Our Learn Centre features an extensive library of videos, articles and guides to help you learn about trading and the financial markets for both new and experienced traders.